The Elephant Age is the average age that a child outside of our system is doing the same mathematics as your child. 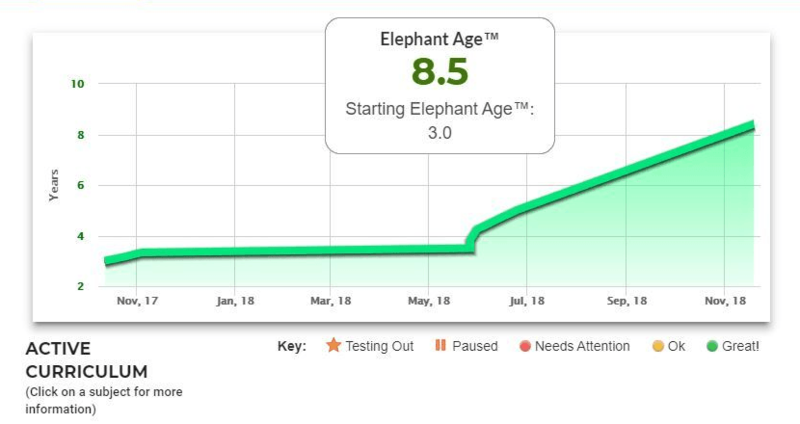 We calculate, and graph, the Elephant Age when your student passes milestones within our system. As your child passes milestones, the graph will update, and so will the Elephant Age. The Starting Elephant Age is displayed once your student has completed the placement exam. 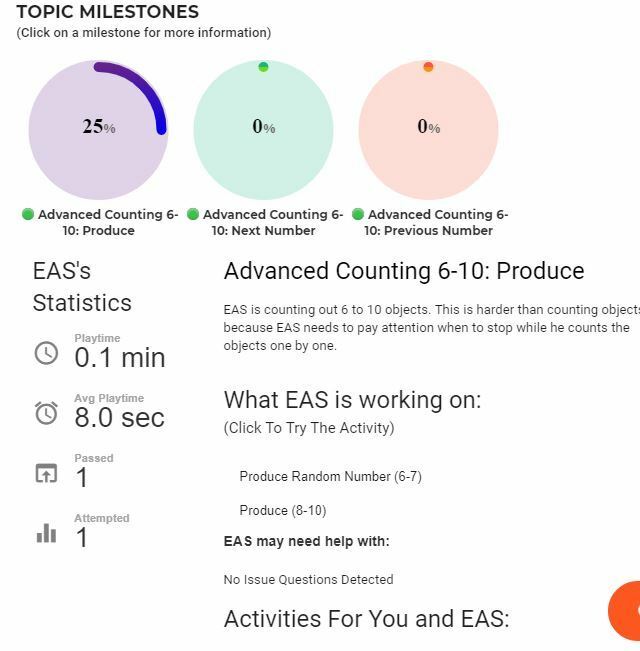 Underneath the Elephant Age Graph, we provide details into what your student is working on and an indication as to how they are doing. The subjects that your student is currently working on is displayed here, and the percentage complete they are with each subject. Next, to the name of the subject, we give an indication of the current status of that subject. For example, if your student is being tested out of a subject via the Placement Exam, we indicate that next to them. name of the subject with a Star. 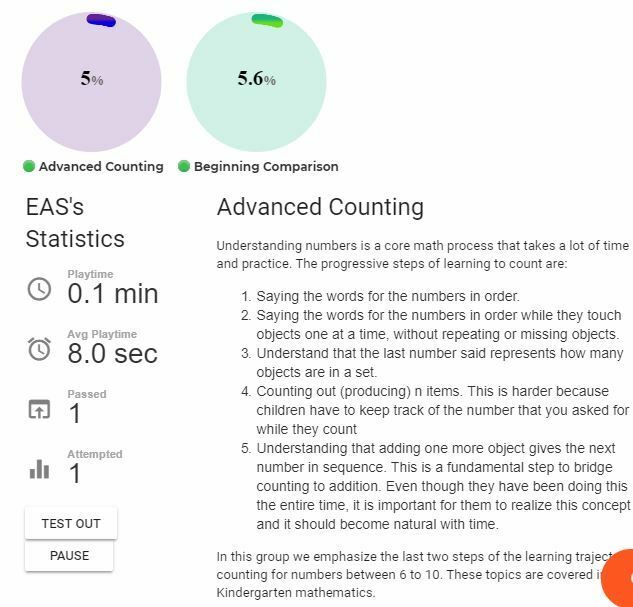 We are also analyzing the number of incorrectly answered or skipped questions within each subject and when we detect that a child may be struggling we will place a red dot next to the subject. This is just to bring your attention to the subject so that if you are working with your child outside of the system you know where to focus your time. To get more information, click on any of the subjects on the screen, and more information will appear. 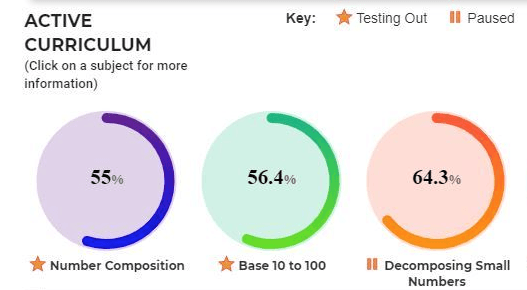 Once a subject has opened, you will see details on what the subject covers as well as statistics on your student’s play. The statistics help you get a better insight into how they are doing and whether they may need extra attention. If a subject is too easy for a student, you may test them out of this subject or if the subject is proving too challenging and you wish to pause it while you work with the student outside of the system you may do that here as well.